Garden Art, Whimsy and More! WOW-I am one of 7 artists invited to exhibit in a show called “In Our Care” at the Center for Creative Leadership, located on Route 220, just north of Greensboro, NC. As I mentioned in an earlier post, when Laura Gibson, the art coordinator and an animal advocate, invited me, I was thrilled. This is a very prestigious place to exhibit and I had the privilege of showing there a couple of years ago as a member of Alamance Artisans Guild. I’m still yelling “WooHoo” out loud, but probably at this point the people in downtown Raleigh can’t hear me, just those around the outer Beltline. 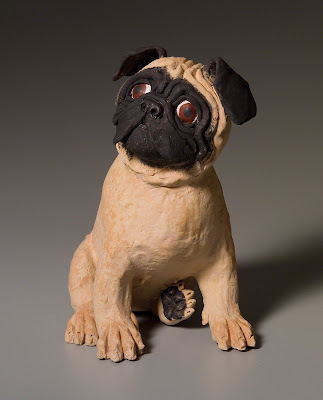 I got to see some of the exhibit when I brought my work to the Center–it is great. The work is very diverse, but Laura knows how to hang a show. 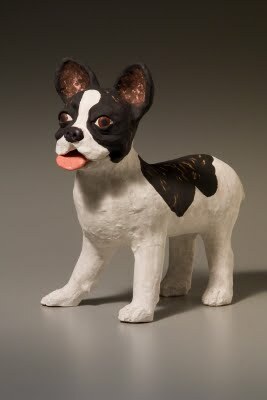 Now, I mentioned 7 artists–the 7th is a canine. Netop, the painting dog, will be at the reception–he loves creating art and makes excellent work! Seriously, some of his work reminds me of Chinese watercolor–I took a class in that–it wasn’t easy! Fawn. I gave her big paws because a pug owner told me hers was a big dog in a little body. I got a visual image of a lion, then the big lions in from of the Biltmore House in Asheville, NC. So I made Fawn’s paws like those you might see on a lion statue. There really is a method to my madness! 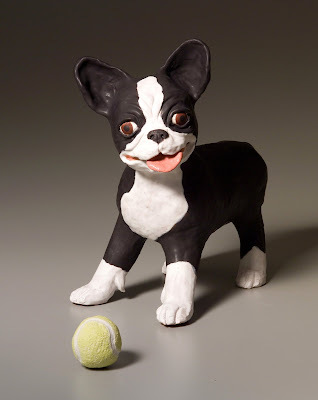 Roxie (the tennis ball is also clay, with underglaze). I like the idea of the dog looking more toylike than her toy. Also in the show are Opal (the only sculpture that looks like one of our dogs), Madge, and Pepper. I’ll post those photos after the reception. There is one more big dog, Paisley (a pied brindle French bulldog), but she developed a hairline crack on her third firing, so she’ll be staying with me. That happens when clay gets fired multiple times, though I have to admit I have been very lucky. I hated to see it happen, since she was a lot of work, but I’m happy to keep her. 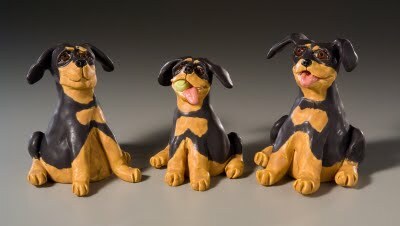 When I took the dogs to Jason Dowdle, my awesome photographer, his dogs (Roscoe and Riley) started sniffing them. Roscoe also got very excited when he saw the tennis ball–he wanted me to throw it! A portion of every sale at the reception will help support Red Dog Farm, in Greensboro, NC. They rescue and find foster homes for cats, dogs, farm animals, alpacas, you name it. I hope you will check out their website and find out how you can help. If everyone did a little something, it would make such a difference in the lives of these precious creatures! 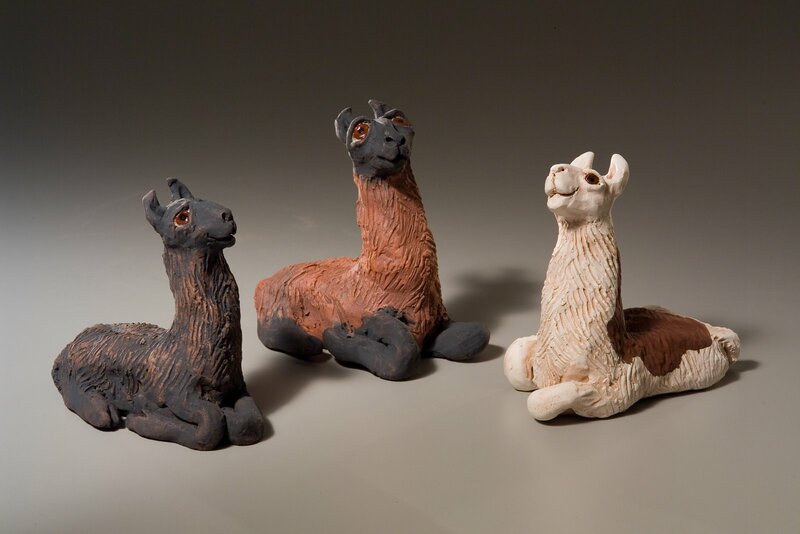 If you’d like to see the show, but can’t attend the reception, please call Laura at (336) 510-0975. For announcements of new art and special events, please sign up here.